Background Aortic structural damage (ASD) may complicate the course of patients with giant cell arteritis (GCA). However the frequency and outcome of ASD has not been assessed in long term prospective studies. Methods In a previous screening of 54 biopsy proven GCA patients, significant ASD was detected in 12 (22.2%) after a median follow-up of 5.4 years. These patients were periodically evaluated (every 4 years) over a median of 10.3 years (range 4–16.6 years) in order to investigate the development of new ASD and the outcome of previously detected abnormalities. Results 18 of the 54 patients abandoned the study due to death or other reasons. The remaining 36 patients were subjected to a second screening and 14 to a third screening. 12 (33.3%) of the 36 patients re-screened and 16 (29.6%) of the initial cohort developed ASD, all but one in the thoracic aorta. Aortic diameters at the ascending and descending aorta significantly increased over time. One patient (1.9% of the initial cohort) died from aortic dissection. Surgery was advised in eight (50%) patients with ASD but could only be performed in three patients (37.7%). The development of ASD was not associated with persistence of detectable disease activity. Conclusions The incidence of ASD is maximal within the first 5 years after diagnosis but continues developing over time, affecting up to 33.3% of individuals after long term follow-up. Once ASD occurs, dilatation increases over time, underlining the need for periodic evaluation. Surgical repair is feasible in about one-third of candidates. The aim of this study was to perform a prospective longitudinal evaluation of a patient cohort previously screened for ASD in order to assess the development of new ASD and the outcome of previously detected abnormalities over an extended follow-up period. The study group comprised 54 patients (14 men and 40 women) with biopsy proven GCA systematically screened for ASD, 5.4 years (range 4.0–10.5 years) after diagnosis. The results of the first screening have been published previously.12 After this initial assessment, patients were subjected to a longitudinal, prospective follow-up and the same screening protocol was performed approximately every 4 years. If relevant ASD was detected in the initial screening, additional imaging was performed when judged appropriate by the consultant cardiovascular surgeon. All patients were treated and followed by the authors according to uniform criteria.12 The screening protocol consisted of a medical evaluation and routine blood tests, including acute phase reactants. Serum concentrations of proinflammatory cytokines (interleukin 6 and tumour necrosis factor α) were measured by immunoassay according to the manufacturer's instructions (R&D Systems, Minneapolis, USA). A chest x-ray was performed in all patients and compared with that obtained at the time of diagnosis. When aortic dilatation or changes with respect to previous radiographs were suspected, even minimal or questionable, a contrast enhanced spiral chest CT scan was performed and aortic diameters were measured at different segments. The abdominal aorta was evaluated by ultrasonography (US). CT and ultrasonography results were compared with those obtained at the initial screening. As previously stated, significant ASD was defined as focal dilatation (saccular or fusiform aneurysm) or, in the case of diffuse dilatation, when the aortic diameter exceeded 4 cm at the ascending aorta or reached at least 4 cm in the aortic arch/descending aorta or 3 cm at the abdominal aorta.8 ,15 Clinical data recorded included number of relapses, time to first relapse, time required to achieve a maintenance prednisone dose <10 mg/day and time to complete prednisone withdrawal. Relapses were defined as recurrence of cranial, polymyalgic or systemic symptoms, including anaemia not attributable to other causes, which completely resolved by increasing prednisone 10 mg above the previously effective dose. Relapses were usually accompanied by mild to marked increases in acute phase reactants. However, isolated variations in erythrocyte sedimentation rate or C reactive protein were not considered relapses unless the above mentioned disease features appeared. 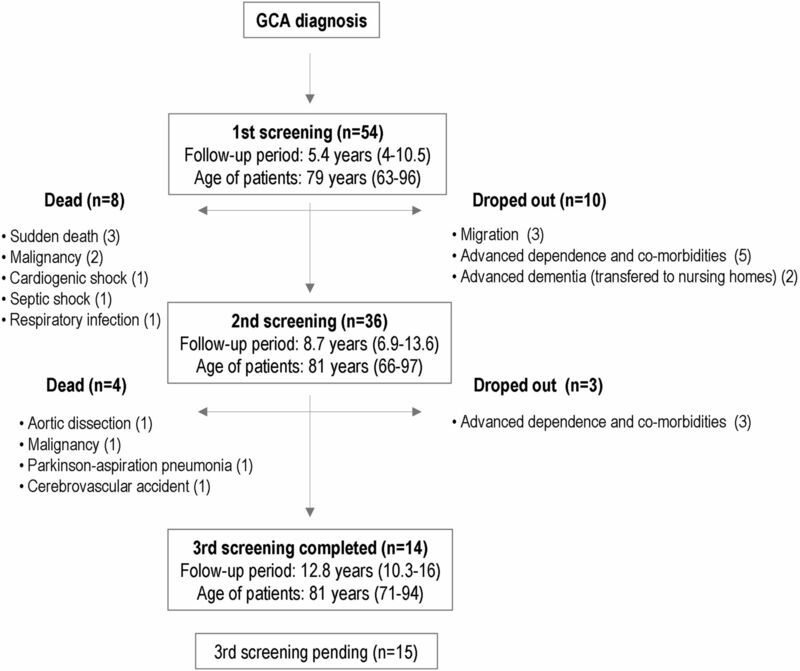 Number and cause of deaths and survival time from GCA diagnosis were also recorded. Comparisons between groups were performed using a t test for continuous variables and Fisher's exact test for categorical variables. Time to first relapse, time required to achieving a maintenance prednisone dose <10 mg/day, time to complete prednisone withdrawal and time to death were analysed by Kaplan–Meier survival analysis and compared using the log rank test. The initial cohort of 54 patients was prospectively followed for a median of 10.3 years (range 4–16.6 years), until death, dropout, the third screening or March 2013. During the study period and before the second screening, 18 of the 54 patients died or abandoned the study for major logistical difficulties in continuing visits at a referral centre (figure 1). A second screening was completed in the remaining 36 patients (10 men and 26 women; 66.6% of the initial cohort) after a median follow-up of 8.7 years (range 6.9–13.6 years). Seven of these patients dropped out before the third screening (figure 1) which, to date, has been completed in 14 patients (median follow-up 12.8 years, range 10.3–16 years). The remaining 15 patients will be eventually re-screened within the next 2 years if they continue their scheduled appointments. Flowchart of the outcome of the study cohort. A remarkable drop out occurred during the study period, due to advanced age of the study population. GCA, giant cell arteritis. During the overall study duration, 12 (33.3%) of the 36 patients who completed the second or third screenings and 16 (29.6%) of the 54 patients encompassing the initial cohort, developed ASD. In 12 patients, ASD was detected at the first screening, in three at the second assessment and in one at the third evaluation. Figure 2A shows the percentage of patients who developed ASD over time. Patient outcome according to the presence or absence of aortic structural damage (ASD). (A) Percentage of patients with ASD over time (weeks). (B) Percentage of patients alive over time (weeks). (C) Relapse free survival. (D) Proportion of patients receiving glucocorticoid therapy over time (weeks). Table 1 summarises the characteristics and outcome of ASD in these patients. In 15 of the 16 patients with ASD, dilatation was found in the thoracic aorta, and only one patient had a small fusiform aneurysm located at the abdominal aorta that remained stable over time. This aneurysm was detected at the first screening. It is unclear whether this aneurysm was related to GCA or to atherosclerotic disease. No abdominal aneurysms were detected in additional patients during follow-up. According to the screening protocol designed for potential general use, assessment of the thoracic aorta was initially based on a chest x-ray. However, 44 (81.5%) of the 54 patients underwent a CT scan at some point during follow-up because of a slight, moderate or high suspicion of aortic dilatation, allowing accurate measurements of the aortic diameters. As shown in table 1, aortic diameters increased over time in patients with ASD. Table 2 shows aortic diameters at various segments of the thoracic aorta in 17 patients who underwent a CT scan in both the first and second screenings. A significant increase in the diameters of the ascending and descending aorta was observed. This was at the expenses of patients with ASD in the first CT scan, indicating progressive dilatation over time of the damaged aortic segments. At the end of the follow-up period, eight (50%) of the 16 discovered dilatations were candidates for elective surgery, according to general consensus guidelines for surgical repair of aneurysmal disease.16 However, aortic reconstructive surgery was performed in only three patients (37.5% of candidates for surgery, 18.8% of those with dilatation and 5.5% of the entire patient cohort). In the remaining five, surgery was not advised because of advanced age and comorbidities (three patients) or patients themselves declined intervention after being informed of the potential risks (two patients). One of the three patients who underwent surgical repair of an ascending aortic aneurysm exhibited diffuse dilatation of the aortic segments distal to the aortic prosthesis at the second screening. Another patient suddenly died 6 months after surgery. Forty-one of the 54 patients were followed until the end of the study or death, and 13 abandoned the study (figure 1). During the study period, at least 12 patients (22.2% of the initial cohort) died. One patient developed an aortic dissection and died shortly after the discovery of an ascending thoracic aneurysm at the second screening which, at that time, was not considered large enough to warrant surgery. At the time of death, the patient was in stable remission and had been able to withdraw corticosteroids 5 years before. This death was considered GCA related. As shown in figure 1, eight additional deaths were unrelated to GCA and three were sudden deaths at the patient’s home, including the above mentioned patient who underwent aortic repair 6 months before. Necropsy studies of these three patients were not performed and an acute aortic complication as the cause of death cannot be confirmed or ruled out. Therefore, mortality directly related to aortic complications in our patient cohort was at least 1.9%. Extended follow-up of the original cohort showed a trend towards an increased mortality (any cause) among patients with ASD although differences did not reach statistical significance (figure 2B). There were no significant differences in follow-up duration between patients who did or did not develop ASD (9.8 ± 3.1 vs 10.7 ± 3.1 years, NS). At the end of the follow-up period, 11 patients achieved sustained remission with no relapses and 43 patients experienced at least one (median 2, range 0–7). The proportion of patients in sustained remission throughout the study period was significantly higher among patients with ASD (figure 2C). Accordingly, ASD was more frequent among patients without recurrences (73%) compared with those who had experienced at least one relapse (16%) (RR 4.47, 95% CI 2.07 to 9.63, p=0.001). Patients who developed ASD suffered significantly lower numbers of relapses than patients without ASD (mean 0.9 ± 1.2 vs 2 ± 1.5, p=0.006) during the study period. At the end of the follow-up period, 36 patients had been able to withdraw therapy and 18 patients were still on prednisone (median 2.5 mg/day, range 1.25–12.5). Only one of the patients who developed ASD was receiving corticosteroids at the end of follow-up (6.2 years). Patients who developed ASD needed shorter periods of time to achieve a maintenance prednisone dose lower than 10 mg/day than patients without ASD (mean 45±32 vs 79±65 weeks, p=0.015) and to completely withdraw therapy (mean 213 ± 37 vs 423 ± 41 weeks, p=0.001) (figure 2D). The overall dose of prednisone required at the end of follow-up was also lower among patients who developed ASD (9.5 ± 4 vs 15.4 ± 7.1 g, p<0.001). 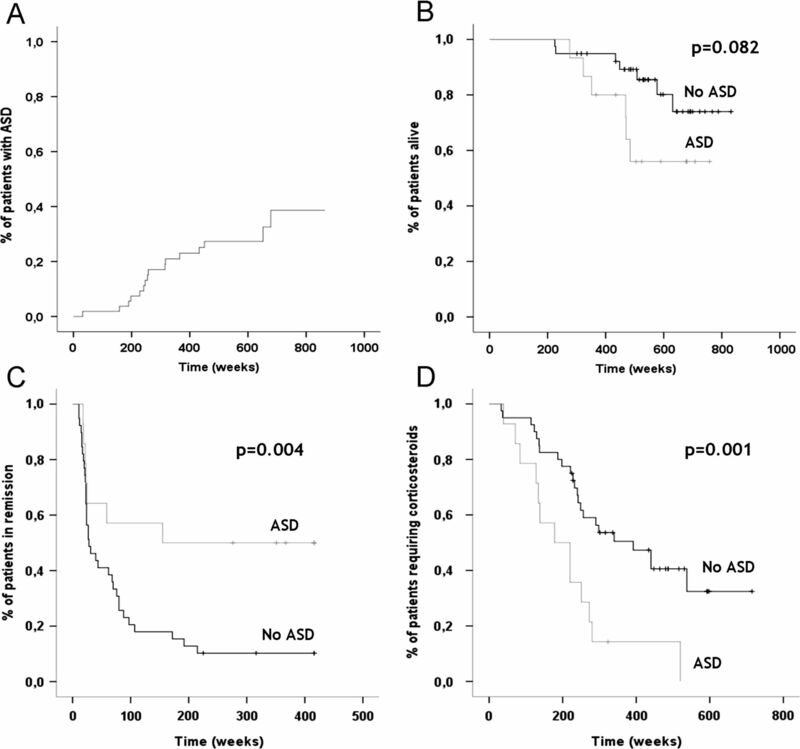 Patients who developed ASD exhibited lower levels of the acute phase reactants erythrocyte sedimentation rate and haptoglobin at different time points compared with patients who did not develop aortic dilatation (figure 3). C reactive protein and proinflammatory cytokines (interleukin 6 and tumour necrosis factor α) concentrations did not show significant differences between groups (data not shown). Erythrocyte sedimentation rate (ESR) and haptoglobin concentrations at various time points (diagnosis, first screening and second screening) in patients with or without aortic structural damage (ASD). p<0.05 for the following comparisons: ESR 1st screening, ESR 2nd screening and haptoglobin 2nd screening. GCA, giant cell arteritis. During the study period, histopathological evaluation of the aortic wall was performed in six patients during surgery or necropsy. Three had undergone reconstructive surgery of an ascending aortic aneurysm. Two patients died from GCA unrelated conditions but one also had an ascending aortic aneurysm. Finally, as mentioned above, one patient developed aortic dissection and died. Aortic specimens were obtained a median of 9.2 years (range 5.1–11.1 years) after GCA diagnosis. All of these patients were in stable remission and had been able to withdraw corticosteroid therapy. Two patients exhibited severe atherosclerosis of the aorta. None of the aortic samples exhibited dense inflammatory infiltrates in the media, suggestive of significant ongoing inflammation. Only two patients exhibited scattered mild inflammatory infiltrates at the media. The most striking finding was the significant loss and disarray of elastic fibres, even in areas devoid of current inflammation (figure 4). Serial findings in a patient with giant cell arteritis and aortic aneurysm. (A) Chest x-ray at the time of the first screening did not show aortic abnormalities. (B) Chest x-ray at the time of the second screening was suggestive of aortic enlargement. (C) The CT scan demonstrated an aortic aneurysm at the ascending aorta (50 mm). (D) A few months later, the patient developed an aortic dissection and died. (E, F) Histopathological examination of the aortic wall with haematoxylin/eosin (H/E) and orcein staining exhibited loss and disorganisation of elastic fibres in the absence of inflammatory infiltrates. In about half of the discovered dilatations, surgical repair was advised, according to current guidelines16 but this could be applied to only one-third of candidates. The number of patients subjected to repair was too low to draw conclusions about the advantages of elective surgery. Surgery was followed by distal dilatation of the remaining aorta in one patient and sudden death 6 months later in another.
. 2012 Revised International Chapel Hill Consensus Conference Nomenclature of Vasculitides. Arthritis Rheum 2013;65:1–11.
. Clinical features of polymyalgia rheumatica and giant cell arteritis. Nat Rev Rheumatol 2012;8:509–21.
. Aortitis and aortic aneurysm in systemic vasculitis. In: Grundmann R. ed. Etiology, pathogenesis and pathophysiology of aortic aneurysms and aneurysm rupture. InTech: 137–58.
. Morphological changes in the large arteries in polymyalgia arteritica. Acta Med Scand 1972;533(suppl):135–59.
. Aortic and extracranial large vessel giant cell arteritis: a review of 72 cases with histopathologic documentation. Semin Arthritis Rheum 1995;24:422–31.
. Repetitive 18F-fluorodeoxyglucose positron emission tomography in giant cell arteritis: a prospective study of 35 patients. Arthritis Rheum 2006;55:131–7.
. Aortic involvement in recent-onset giant cell (temporal) arteritis: a case-control prospective study using helical aortic computed tomodensitometric scan. Artritis Rheum 2008;59:670–6.
. Prevalence and characteristics of large-vessel involvement in biopsy-proven giant cell arteritis. Prospective study in 40 newly diagnosed patients using computed tomography angiography. Ann Rheum Dis 2012;71:1170–6.
. Increased incidence of aortic aneurysm and dissection in giant cell (temporal) arteritis. Ann Intern Med 1995;122:502–7.
. Incidence and predictors of large-artery complication (aortic aneurysm, aortic dissection, and/or large-artery stenosis) in patients with giant cell arteritis. Arthritis Rheum 2003;48:3522–31.
. Aortic aneurysm and dissection in patients with biopsy-proven giant cell arteritis from northwestern Spain. A population-based study. Medicine 2004;83:335–41.
. Development of aortic aneurysm/dilatation during the follow-up of patients with giant cell arteritis: a cross-sectional screening of fifty-four prospectively followed patients. Arthritis Rheum (AC&R) 2008;59:422–30.
. Mortality of large-artery complication (aortic aneurysm, aortic dissection, and/or large-artery stenosis) in patients with giant cell arteritis: a population-based study over 50 years. Arthritis Rheum 2003;48:3532–7.
. Should I send my patient with previous giant-cell arteritis for imaging of the thoracic aorta?. A systematic literature review and meta-analysis. Ann Rheum Dis 2014;73:143–8.
. 2010 ACCF/AHA/AATS/ACR/ASA/SCA/SCAI/SIR/STS/SVM guidelines for the diagnosis and management of patients with thoracic aortic disease: a report of the American College of Cardiology Foundation/American Heart Association Task Force on Practice Guidelines, American Association for Thoracic Surgery, American College of Radiology, American Stroke Association, Society of Cardiovascular Anesthesiologists, Society for Cardiovascular Angiography and Interventions, Society of Interventional Radiology, Society of Thoracic Surgeons, and Society for Vascular Medicine. Circulation 2010;121:e266–369.
. Large-vessel involvement in giant-cell arteritis: a population-based cohort study of the incidence-trends and prognosis. Ann Rheum Dis 2013;72:1989–94.
. Giant-cell arteritis with or without aortitis at diagnosis. A retrospective study of 22 patients with long-term follow-up. J Rheumatol 2012;39:2157–62.
. Gelatinase expression and proteolytic activity in giant-cell arteritis. Ann Rheum Dis 2007;66:1429–35.
. Cellular and molecular mechanisms of thoracic aortic aneurysms. Nat Rev Cardiol 2009;6:771–86.
. Lessons on the pathogenesis of aneurysm from heritable conditions. Nature 2011;473:308–16.
. New therapeutic targets in giant-cell arteritis. Considerations based on the current pathogenic model and the availability of new therapeutic agents. Clin Exp Rheumatol 2008;26: S141–150.
. Development of outcome measures for large-vessel vasculitis for use in clinical trials: opportunities, challenges, and research agenda. J Rheumatol 2011;38:1471–9. The results were presented in part at the 72nd ACR Annual Scientific Meeting (San Francisco, 2008), the 14th International Vasculitis and ANCA Workshop (Lund, 2009) and the Annual European Congress of Rheumatology (Berlin, 2012). Contributors AG-M, SP-G, JH-R and MCC designed the study. PA, GE-F, MAA, MB, IT-B, AG-M, JH-R and MCC generated the data. AG-M and MCC drafted the manuscript. All authors reviewed and commented on the data. All authors read, commented on and approved the manuscript. Funding Supported by Ministerio de Ciencia y Tecnología) (SAF 08/04328) and Ministerio de Economía y Competitividad (SAF 11/30073). AG-M, GE-F, MB, IT-B and SP-G were supported by a research award from Hospital Clínic. AG-M was supported by Fundació Pedro Pons. GE-F and MCC were supported by Instituto de Salud Carlos III. Ethics approval The study was approved by the ethics committee of Hospital Clinic.